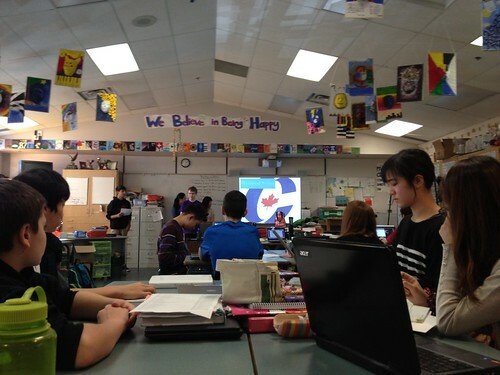 This past week, the TALONS classes have hosted and facilitated half-hour long activities and discussions that have been focused on an exploration of historical contexts and details of Canadian Confederation, as well as an attempt to cultivate the recently discussed Dispositions of Democratic Discussion. After an initial introduction to the Victorian era in the Canadian colonies, the unit’s focus on dialogue and discussion came about through lengthy collective reflections about each TALONS class’ strengths and areas requiring growth in oral participation and facilitation. Generating momentum at the beginning of a unit / week / class meeting: using hook-questions, soliciting initial opinions, and establishing a pace that invites broad participation and thinking. Make connections, follow up, refer to visual notes; demonstrate an appreciation of ideas. Isolating the key issue, taking what has been said, and synthesizing the main question, issue, or key idea. Guiding the discussion or lecture with questions and participant-responses, and discovering what types of questions or comments offer the most substance? Inducing conversation, laughter, ease and comfort. Allowing for quad/small group chats. Posing questions generated within the moment. Providing or soliciting visual notes. Framing the topic or issue within the group’s existing understanding. Involving the reluctant speaker by experimenting with the questions being asked, the format of the discussion, or style of engagement and individual participation. On Monday there will be a traditional exam on the topics covered, and reflection assignments intended to synthesize personal and group learning about the skills and dispositions required for fruitful constructivist learning; it seemed appropriate to attempt to summarize my own observations of the unit. Each of the different discussions, debates and activities that the quads arranged found unique avenues toward involving a broader range of their classmates in a negotiation of understanding of the topics. The different role-plays, mock-Parliaments, and small-group discussions created diverse entry-points and opportunities for quieter individuals to engage with their own thinking, that of their peers, and the new comprehension of the topics that came out of the process. The group’s and individuals presenting material or discussion points on the various topics were consistently humble in their own interpretation of the facts, and were quick to invite multiple perspectives into the conversation. Going forward, for my part I would like to focus on building on cultivating greater mindfulness and deliberation by exploring the different ways that individuals can document and share their individual understanding (beyond classroom dialogue) in the hope that our time spent in discussion can go beyond the initial concepts to ask more philosophical, or related questions on the topics covered. I think this synthesis of ideas beyond basic understanding will ask for a more consistently mindful approach to the class’ collective goals. This will require not only that discussion-participants raise the intensity and attentiveness of their own engagement with their ideas and one another, but that our moderators and classroom leaders are able to recognize and articulate the group’s learning intentions with clarity, and provide the modeling and facilitation to bring these goals about.